i would have to concur. 100%. this quote would have gone nicely with my post a little while back on my feelings about my "own style"
and what styles not necessarily "define" me but truly allow me to express myself or how i am feeling. 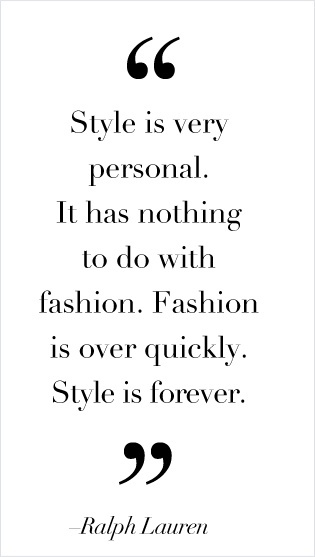 style can't be learned & "style is forever"
I agree, style shouldn't define you. However it should be a statement that reflects yourself and your desires. By this I mean that if a woman were to dress in tight, revealing clothes it conveys the notion that she's trampy or trashy. On the other hand, if a woman were to dress in sweats it could say to the world that she doesn't care or is insecure. Clearly, these are generalizations. Regardless, they do happen - I'm even guilty of assumptions about people based upon what they wear. This is a tough call to make; people should be encouraged to express themselves and dress for their pleasure and no one else's, yet when that happens they will always be at the mercy of the judgments of others.